Clockwise from left: Aniba Hotep, Brian McKnight, Isaiah Sharkey, Shoshana Bean. If you're a regular All Things Considered listener you know that Thanksgiving Day is all about music. As part of a tradition now four years running, host Ari Shapiro speaks to four different musicians, each one pointing to the next as an artist whose work they are thankful for. 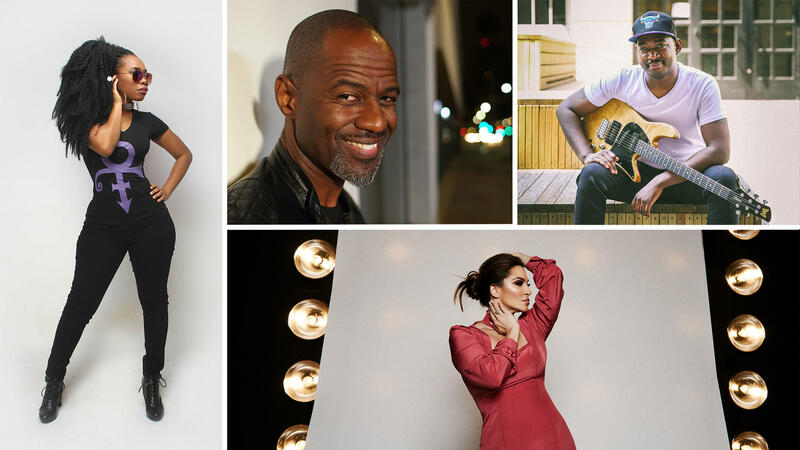 This year's chain of gratitude begins with an especially significant pick for Shapiro, pop vocalist and former Broadway veteran Shoshana Bean — with whom he went to high school — and makes its way to R&B singer-songwriter Brian McKnight, guitarist Isaiah Sharkey and Southern soul singer Aniba Hotep. Hear the four-part conversation at the audio link on this page, and read excerpts below. On crossing over from Broadway to pop: "I think there was so much proving I had to do. As soon as people hear you're from Broadway, they just hear you that way, instead of giving you a clean ear. I don't feel like I have anything to prove anymore, and I think that confidence of self kind of shows in my record." On Brian McKnight: "He was the first person to really look at me as more than a Broadway performer. I've had magical moments like that along the way when I've gotten the opportunity to meet and work with people that I used to think were untouchable, who I held as idols when I was younger — from Michael Jackson to Whitney. Brian is definitely one of them. To merge jazz and R&B in the way he did on a pop record, at the time ... it was innovative. It was new." On paying his success forward to younger artists: "I can't imagine that there's anybody that has made it, in any industry, that didn't get help getting there. When I see somebody that has talent, if there's anything that I can do, I will do that. If it's making a phone call, if it's trying to get them in front of someone that can help them, if it's writing a song with them, if it's something, I always feel like that's paying it forward, for somebody doing something like that for me." On Isaiah Sharkey: "He sings, he plays, he writes. He's one of the most talented musicians. He's a fantastic guitar player, that's his main instrument. When he came to audition, the first time we did the studio sessions for the album Better, he came in and played Steely Dan note for note, and he won me right there." On going from a backup player to releasing his own music: "I always played with other artists, and I always created at home or on my own spare time. I wanted to do my own music, and put it out for people to experience. I wasn't intending on singing ... but it just so happened the compositions and songs I was writing required vocals and required lyrics, and I felt that it would be really difficult to get some fantastic singers to tour with me consistently. So I said, 'Well, you know, I can hold a note a little bit, so I'll sing.' "
On Aniba Hotep: "Her lyrics touch on a lot of different subjects, from being in love to social issues — just everything you can possibly think of, she writes about. I admire that about her, and she's an incredible singer as well. She can give you an Aretha Franklin type of thing, but she can also give you a Carole King type of vibe or a Brittany Howard type of thing. She's amazing." On her musical influences growing up: I'm originally from Virginia, from a small town, and there wasn't an urban radio station. So I learned and was fed a lot of the Eagles, The Doors, Jefferson Airplane and a lot of what people call heartland rock. But I also grew up in a baptist church. I'm also a child of hip-hop. As I got older, I got more exposure to jazz — then, in college, all of the psychedelic '60s rock and trip-hop, drum-and-bass from the U.K. Everything that touched me, I'm sure that it comes out in my own interpretation of music." On the artist she's thankful for, Lianne La Havas: "I think I discovered her maybe five or six years ago, and I thought her tone was just so incredible. ... I love all kinds of music, obviously. But lyrics that seem really personal, and an energy that you can't get anywhere else — like, it's very specific to the person — that's always a draw to me. She provides that in spades." Christina Cala and Fatma Tanis produced and edited the audio of this interview. SHOSHANA BEAN: (Singing) What would you do if I sang out of tune? Would you stand up and walk out on me? Shoshana Bean has the kind of show-stopping voice that makes people ask - has she always sounded like that? Well, I can definitively answer that question - yes, she has - because Shoshana Bean and I went to high school together. BEAN: (Singing) And I'm gonna try with a little help from my friends. And I get high with a little help from my friends. SHAPIRO: Now, NPR doesn't generally like us to interview our friends. But today I get the dispensation because, for the last four years on Thanksgiving, I've brought you a long chain of musical gratitude passed from one artist to another. And I get to kick us off with a musician I am grateful for. And Shoshana, this year, that is you. Welcome to ALL THINGS CONSIDERED, and happy Thanksgiving. BEAN: Thank you, my friend. Happy Thanksgiving. SHAPIRO: You and I have not stayed in close touch since high school. But I've been listening to your music ever since you started releasing albums about 10 years ago. And so I feel like we've remained close even though we haven't really had conversations like this one. BEAN: That's true. This is a treat. Thank you. SHAPIRO: You started as a Broadway actress, and you were hugely successful. You were one of the first people to play Elphaba in "Wicked." You were in "Hairspray." What made you decide to move to LA and pivot away from theater? SHAPIRO: I remember those days well, yes. BEAN: (Laughter) I feel like I decided back then that that was what I was going to do with my life, was be a pop star. And the trajectory, you know, sort of took me through theater because you couldn't, back then, go to school for pop star or major in pop star. So I chose theater as a way to just be able to be onstage and keep singing and keep performing but in my mind knowing, like, as soon as I'm done with this, I'm going to go, you know, be a pop star. BEAN: (Singing) I've never heard the sky so windy (ph) before. And I've never felt it shake me down, down to my core. BEAN: I titled it "Spectrum" because people have come to know me or know my music for very different reasons, and it's made it very difficult to please everyone. So this album just sort of became something that represents every stop along the way, every bit of influence, from blues to R&B to jazz to my Broadway roots as well. SHAPIRO: Let's talk about one of the tracks on the album. Tell us about "All To Me." BEAN: (Singing) I'm not looking for perfection anymore. "All To Me" is actually an original. I wasn't doing well as a writer at the time. I was like, I'm not liking what I'm writing; I'm not finding a lot of inspiration. And this one, I just tossed into the ring. And I thought, this isn't going to fit the vibe; it's not the right sound. And the guy who arranged the album (laughter), he turned it into something that not only fits but is definitely my favorite on the record. I'm so proud of this song. SHAPIRO: It's interesting to hear you say that because you're known for being such a powerhouse. This is much more subtle. BEAN: ...Instead of giving you a clean-eared chance. And so I don't feel like I have anything to prove anymore. And I think that confidence of self kind of shows in this record. And that might be what's happening on this track (laughter). BEAN: (Singing) Just show it all to me. I want to have it all. I want to have it all. SHAPIRO: Well, that's a beautiful way to transition into the next phase of this conversation. You get to keep our musical train of gratitude moving forward. So tell us about an artist that you're especially grateful for on this Thanksgiving Day. BEAN: I have to - you know, in speaking about how difficult it was to transition from being, you know, a Broadway performer to attempting to make music and be heard and seen in the recording industry, I have to credit someone who was a major force in that transition. And that is Brian McKnight. SHAPIRO: (Laughter) Some of our younger listeners may not be aware. A Discman was a portable CD player. BEAN: (Laughter) Thank you. Thank you. I - mine was bright yellow, to be honest. BEAN: Brian's first record - I think it was self-titled, "Brian McKnight." Oh, gosh, I just - no one had come out riffing like that. No one was moving or singing R&B like that. And his album came out, and I just rewound and rewound and rewound those riffs. And I, you know, attempted to imitate, and I would just - over and over again until I could get them. BEAN: So already he was a musical legend to me and a huge influence. And then, a friend of mine introduced me to his manager when I was in "Wicked." and his manager started working with me. And then he brought Brian to the show, one of my first shows on when I took over for Idina. SHAPIRO: Idina Menzel, who originated the role, yeah. BEAN: And then he just sort of became, like, a very subtle champion for me. I remember my manager calling me one day and saying, we're doing, you know, the Soul Train Lady of Soul Awards. And they're honoring Aretha, and they want Brian to sing something. And Brian said, why am I going to sing something to honor Aretha? Bring Shoshana in. Bring Shoshana in; have her sing "Ain't No Way." MCKNIGHT: Ladies and gentlemen, Ms. Shoshana Bean. BEAN: (Singing) I know that a woman's duty is to help and love a man. BEAN: You know, he gave me a chance on a huge platform that, you know, not many people would think to give someone like me. SHAPIRO: When you reach for his music these days, is there a song that you particularly gravitate towards? BEAN: Yeah, there it is. (Vocalizing) - uh-huh, uh-huh. (Vocalizing, laughter). MCKNIGHT: (Singing) Is the feeling gone, my love? Is it not as strong to you? BEAN: Oh, Brian McKnight (laughter). MCKNIGHT: (Singing) Oh, are we still in love? Has the fire died, my sweet? Don't I sweep you off your feet? SHAPIRO: Well, we're going to play this for him. So is there anything that you would like to say directly to Brian? BEAN: Oh, gosh - without crying? B, I just will never be able to express my gratitude for the opportunities you gave me. I just thank you for your generosity and for giving me an opportunity to be seen as more than a Broadway artist. And I love you, and I miss you. MCKNIGHT: (Singing) Are they dead and gone? Oh, oh, oh - have they gone away, my sweet? Or am I buried somewhere deep inside of you, my love? SHAPIRO: Shoshana Bean's latest album is "Spectrum." Shoshana, happy Thanksgiving. It's so nice to talk to you again. BEAN: I love you, man. Happy Thanksgiving. SHAPIRO: Thank you. Happy Thanksgiving. SHAPIRO: And Brian McKnight joins us now. Happy Thanksgiving. MCKNIGHT: (Laughter) That's a great way to start this, isn't it? Now I'm crying. I - wow. That was - that was amazing. I think you very rarely get to hear what impression you've made on people. And they can tell you how much they're appreciative of what you do. But when you're standing in front of them, it's different than when they have an opportunity to speak about you when you're not there. SHAPIRO: I know some people who have become successful who feel so protective - like if they give someone else a bit of success, it means less for them. And you obviously have made a point of giving people a leg up. You've been in the public eye for so many years now. You first made it big in the '90s. Has that always been part of what you do, or was that something that took time for that to be incorporated into your life? MCKNIGHT: I can't imagine that there's anybody that has made it in any industry that didn't get help getting there. MCKNIGHT: When I see somebody that has talent, if there's anything that I can do, I will do that - if it's making a phone call or if it's trying to get them in front of someone that can help them, if it's writing a song with them - if it's something, I always feel like that's paying it forward for somebody doing that for me. SHAPIRO: OK. Well, then, move this train forward. I know you've worked with some of the legendary greats of music. Tell us about somebody who you're thankful for today who we might not have heard of, somebody who you have your eye on. MCKNIGHT: You know, there's a guitar player - he's relatively young - out of Chicago who came in to sub for my present guitar player. And when he came in to sub for him, that was the last time we saw that other guitar player. SHAPIRO: (Laughter) So who is this brilliant young guitar player? MCKNIGHT: Not that the other guys were bad - but this guy's name is Isaiah Sharkey. ISAIAH SHARKEY: (Singing) It's a shame, the way you mess around with your man. It's a shame, the way you hurt me. MCKNIGHT: I'm telling you about him because he also has his own records. He sings. He plays. He writes. He's one of the most talented musicians. I'm not even talking - he's a fantastic guitar player. That's his main instrument. But when he came to audition, the, first time we did the studio sessions for the album "Better," he came in and played Steely Dan note for note. MCKNIGHT: And he won me right there. SHAPIRO: Is there one song of his that you especially love? MCKNIGHT: The record that he just put out, I think that from the first downbeat, you realize that this is not anything like anything you've ever heard before. So I can't pick one in particular song. I would say, just like in the past, he is a throwback to the past where you have to put it on and actually listen to the body of work. In a single-oriented world where we live in now, I think that what Isaiah has done - and what I've always tried to do - is to present an album in a way that you go through a musical journey. SHARKEY: (Singing) When we fuss and fighting, I can't get no sleep at night. SHAPIRO: Well, we're going to play this for him. So is there anything you would like to say to Isaiah Sharkey? MCKNIGHT: I would say everything that I've always said to him. He is truly one of the greatest musicians that I've ever heard or been around. What he's able to do is to inspire me to go back and practice more. And I really appreciate him for that because that doesn't happen every day. You try to practice. You try to get better. But then you meet someone who's so gifted that you say - hey, I've got to step up my game even more if I'm even going to stand on the stage next to this man. So my hat's off to him for real. SHAPIRO: Well, Brian McKnight, it's been so great talking to you. Thank you for this. SHAPIRO: And Isaiah Sharkey is with us now from Chicago. Happy Thanksgiving. SHARKEY: Oh, happy Thanksgiving to you. SHAPIRO: What was it like to hear that from Brian McKnight? SHARKEY: Wow. My response is just wow. It's really an honor to hear someone that has that type of gift and that amount of history in being an icon and one of the most talented artists of the last two generations. SHAPIRO: How did you get from being a guitar player to being kind of the frontman writing and recording your own music? SHAPIRO: Yeah, it turns out you're a pretty great singer. SHARKEY: (Singing) Come on, baby. Give me all you have - have to give, have to give. SHAPIRO: Well, Isaiah Sharkey, I want to give you a chance to throw this forward to someone else who you're thankful for on this Thanksgiving Day. SHARKEY: Yes. I am actually thankful for a artist here from Chicago. Her name is Aniba Hotep, and she has a group called The Sol Collective. ANIBA HOTEP AND THE SOL COLLECTIVE: (Singing) Love me now, or I'll go crazy - oh, sweet thang. SHARKEY: ...Or a Brittany Howard type of thing. She's amazing. SHAPIRO: For people who haven't heard her before, what song would you point them to for a first lesson? SHARKEY: That would be "Girlz Like Her." ANIBA HOTEP AND THE SOL COLLECTIVE: (Singing) She say a lot of things. Oh, what she say? The kind of things that cause you pain. She kind of hoping that you don't see. She went from just your friend to your beginning and your end. And you couldn't object 'cause you can't remember agreeing. SHAPIRO: What do you get from listening to this? SHARKEY: Well, you can hear all of her influences, you know? She's influenced by Prince. She's also influenced by all of the great female vocalists of soul music, but she also listens to Sting. She listens to David Bowie. You know, she has her own version of her gumbo. SHARKEY: And I love artists that take all of their musical experiences and somehow they're able to marry all of those different experiences together. ANIBA HOTEP AND THE SOL COLLECTIVE: (Singing) Girls like her don't play with circumstances. Girls like her don't fly with chances. SHAPIRO: Well, we're going to play this for her. So what would you like to say to her on this Thanksgiving Day? SHAPIRO: Aniba, you are absolutely fantastic. I love your energy. I love your music, and I look forward to doing more work with you. And I look forward to the world hearing what you have to offer. SHAPIRO: Well, Isaiah Sharkey, thank you for spending this time with us today. And happy Thanksgiving. SHARKEY: Thank you. Happy Thanksgiving to you. SHAPIRO: And Aniba Hotep is with us now. Hi, there. ANIBA HOTEP: Hello. How are you? SHAPIRO: I'm doing great. Thanks. What was it like for you to hear that just now? HOTEP: You know, it's high praise. Sharkey is definitely a Chicago musical hero. He's such a example of everything that is possible when you pursue what you love. And he's such an exceptional talent that when you get his attention, you always feel, like, really special. Other people might not admit that. I have no problems admitting it. You know, Sharkey said something to me - I'm like, I'm a genius because Sharkey. ANIBA HOTEP AND THE SOL COLLECTIVE: (Singing) And she won't hesitate to play that game and change the picture, change that frame and make him think he's living a life of his creation. SHAPIRO: He talked about your sound and your influences. And there were a whole lot of names there, from Aretha to Prince to Sting and Carole King, David Bowie and on and on and on. Tell us about your influences and where your sound comes from. HOTEP: ...And Jefferson Airplane and a lot of what people call heartland rock, but I also grew up in a Baptist church - so all of those influences. I'm also a child of hip-hop. But as I got older, I got more exposure to jazz. And then, you know, in college, all of the psychedelic, like, '60s rock and trip-hop and drum-and-bass from the U.K.
SHAPIRO: That is a lot. That is a lot in the melting pot. Is there a song of yours that you can point us to that kind of shows that mashup in action? HOTEP: Goodness (laughter). I guess there's a song called "The Rose." ANIBA HOTEP AND THE SOL COLLECTIVE: (Singing) You took my heart and laid it across your chest. And I hope that it bleeds for you. HOTEP: And it's an acoustic rock kind of fusion, but the vocals are very soulful and just the core of me. ANIBA HOTEP AND THE SOL COLLECTIVE: You were my chosen mean. I was your rose, and you picked me from everything you thought was good, yeah. SHAPIRO: This is a brand-new track that you just released this week. Tell us about it. HOTEP: It's very personal, as a lot of my music is. And it's the story of the kind of love that I would consider great or special or monumental. And it's an ode to that. SHAPIRO: Well, Aniba Hotep, you are the last link in this chain. So to take us out, I would love for you to name somebody you're grateful for who we can listen to to end this journey. Who would you like us to go out on? HOTEP: I'm a huge fan of Lianne La Havas. SHAPIRO: Tell us about her. HOTEP: She's a product of the U.K. And I just thought her tone was just so incredible. And her lyrics, they seem, like, really personal and an energy that you can't get anywhere else. So I'm a big fan of her work. SHAPIRO: What's a track of hers that you find yourself reaching for again and again? LA HAVAS: (Singing) Wasn't it kind of wonderful? Wasn't it kind of wonderful, baby? Wasn't it kind of wonderful, wonderful? SHAPIRO: Well, Lianne La Havas is not going to be with us in the studio. But just in case she's listening to ALL THINGS CONSIDERED on this Thanksgiving, is there anything you'd like to say to her? HOTEP: Just thank you. Thank you for sharing who you are with the world, and thank you for touching me and inspiring me to continue to do the same. SHAPIRO: Aniba Hotep, thank you so much for being part of this. HOTEP: Thank you. Thank you for having me. LA HAVAS: (Singing) Oh, you can burn every fuse and refuse, turn your positive minus. Electricity lingers in our fingers. SHAPIRO: Right now we're hearing the music of Lianne La Havas. Before that, we heard from Aniba Hotep, Isaiah Sharkey, Brian McKnight and Shoshana Bean. And we want to know which musicians you're thankful for this year. Let us know @npratc on Twitter. I'm @arishapiro. LA HAVAS: (Singing) Oh, wasn't it kind of wonderful? Wasn't it kind of wonderful, baby? Transcript provided by NPR, Copyright NPR.